Is for ukulele players in the Campbelltown and Macarthur region, seeking fun and friendship and an environment in which to improve their playing and performance skills. Beginners and established players all are welcome. Monthly meetings held at Campbelltown RSL. Contact us for details. We're always happy to hear from new ukies. 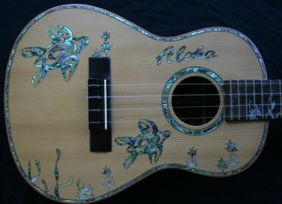 It's hard not to smile when you're strumming a uke...Aloha!